Even with savings of 50-70%, extensive treatment patients such those that need full mouth restoration, still seek financing for their visit to the dentist in Mexico. 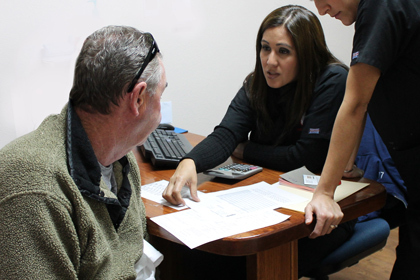 Algodones patient discussing treatment plan and costs with dental staff in Mexico. This article discusses your dental financing options for Mexico dentistry. When you choose to have your teeth cared for by a dentist in Mexico, you are already making a major dent in the bill you will receive – 50-70% is typical. But if you’re one of the many who look to Mexico for dental care because they need major restorative work, you may still be wondering how you’re going to finance your teeth. Most Mexico dental clinics don’t offer financing for your dental work. For example, a full-jaw implant-based restoration in the USA can run to $30,000. Even with 50-70% discount, that is still a chunk of change! Does CareCredit work in Mexico?